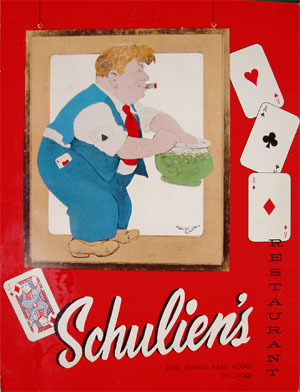 Schulien's was the place to go after a magic show, and was always where the disciples of magic hung out. I can remember staying out late after one of the IBM shows at the 8th Street Theatre, and heading over to Schulien's. Matt Schulien circulated the room, if someone his size could do such a thing. In the smoky, noisy room he asked me what my name was. Since it was so loud, he thought I said "Candy." So I have an autographed menu that says, "To Candy, Sweet as her name. Regards, Matt Schulien, 1962." 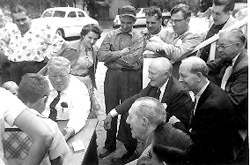 The photo below was taken at a Fox Lake Convention. My recollection of that convention was of falling out of the bed at night and hitting the night stand. I remember having a real shiner the next morning! Hey, I was about six years old! That's Matt on the left and the old gentleman front and center is Okito.